The following was taken from Brimar Sales documentation. Once launched the Tunograph was overtaken in 1935 by the American RCA 6E5G which rendered it obsolete overnight. It is a small cathode-ray tube, where the electron current from the cathode, was focused into a narrow beam and passed through a hole in the anode to a fluorescent screen. A pair of plates were used to deflect the spot and this deflection depended upon the signal strength. The designers of the first 'Magic Eye' registered their first electron-ray tube, the 6E5, on June 27, 1935. 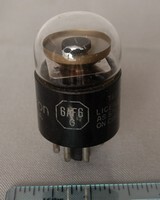 This tube initially appeared in RCA�s console-model product line that same year. RCA was fearing a loss of market share to competitors� new lines of very small and midget radios, many of which were designed and produced in Los Angeles. RCA�s promotion touted the "Magic Eye" as an elegant feature of their upper product line - where profit margins were greatest. Not surprisingly, the 6E5 wouldn�t fit inside the competitors� smallest sets. The name "Magic Eye" quickly gained acceptance with the public as the standard identity for the electron ray tube and tuning eye feature in consumer radio sets, regardless of manufacturer. The tube shown has a concave disc inside that is illuminated on the sides of the bottom edge as the signal is increased the two illuminated edges move towards each other in an arc until they touch at full signal. The TV4 was the first British magic eye on the market, Launched in the summer of 1936. It was more compact than other available types, and after problems with reliability and a short life, the internal structure was modified to correct the problem. It Has side contact Ct8 Base. It also has a standard British 4.0 Volt heater. Mullard end viewing Tuning Indicator with side contact base type Ct8. The EM1 followed the TV4 . The EM1 was introduced to eliminate the problems associated with the old TV4, and had a 6.3v heater. The tube shown has a concave disc inside that is illuminated on the sides of the bottom edge, as the signal is increased the two illuminated edges move towards each other in an arc until they touch at full signal. Mazda AC/ME early Tuning Indicator. The tuning indicator tube, or "Magic Eye" as it is was introduced by RCA, was used to display the optimum signal tuning point of a tuner/receiver, or the peak signal level of a pre-amplifier or tape recorder. 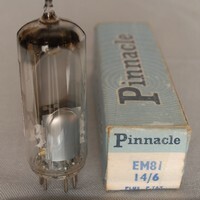 This tube appeared soon after RCA's 6E5. R.C.A. 1629 Tuning Indicator end viewing. The 1629 has a 12V heater and was used as a tuning indicator in the Command set Transmitter. Not unlike the 6E5 but later and more modern than the 6E5GT. 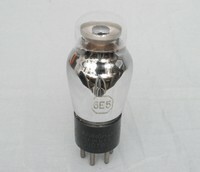 Based on the EM1 Item A0683 this indicator also contains an AF amplifier facility, not actually two valves in one but with amplification incorporated with an amplification factor of 60 maximum. This can reduce the number of valves in a circuit by one in many applications, making this valve unique. The tube shown has a concave disc inside that is illuminated on the sides of the bottom edge as the signal is increased the two illuminated edges move towards each other in an arc until they touch at full signal. RCA 6AF6 End viewing Tuning Indicator. An updated version of the 6E5 launched in 1935. Small neon lamps that are used as indicators in electronic equipment. Called "Tuneons" in the 1930s radio sets, that were fitted with the new Tunograph (Item A1303) which could improve the stability and strength of the signal. However such a device was not cheap, the Tuneon was no more than a modulated neon, and at a lower cost, but it did do what was intended. Not many receivers were manufactured using this device, as the new RCA 6E5G came out in 1935, at the same cost as an ordinary valve. Not actually a Tuning Indicator. When conducting the DM160 will give out light and goes dark at cut-off. In this way it can be used to indicate the logic state of the circuit it connects to. 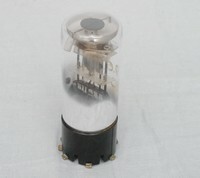 In 1969 Mullard describe the DM160 as: a special quality directly heated sub miniature voltage indicator for use in industrial equipment such as transistorised computers. Mullard EM81. The tuning indicator tube, or "Magic Eye" as it is was called when introduced by RCA in 1935, was used to display the optimum signal tuning point of a tuner/receiver, or the peak signal level of a preamplifier or tape recorder,this is Mullard's 1960's version. The main benefit in tuning reception was for FM tuners where the exact tuning point was harder to determine than for AM. The indicator tube is a standard thin glass tube envelope with a reflective arched disc inside called the target. The electrode structure is based on a double triode with common cathode. The anode of the second triode is called the target and within the electron stream is a deflector electrode designed to alter the path of the electron beam, it would normally be connected to the anode. The tube shown has an arched disc inside that is illuminated on the sides of the bottom edge as the signal is increased the two illuminated edges move towards each other in an arc until they touch at full signal. Telefunken DM70 Tuning indicator for Battery sets. Used to display the optimum signal tuning point of a tuner/receiver, or the peak signal level of a pre-amplifier or tape recorder. The main benefit in tuning reception was for FM tuners where the exact tuning point was harder to determine than for AM. The front of the tube has a black area with an exclamation mark cut into it, the dot is illuminated green with a small portion of the top of the mark also green (when no signal is present) as the signal is increased the area at the top of the mark moves towards the dot until it touches at full strength. The main benefit in tuning reception was for FM tuners where the exact tuning point was harder to determine than for AM. The indicator tube is a standard thin glass tube envelope with a fluorescing strip inside just beyond the target anode. The electrode structure is based on a double triode with common cathode. The anode of the second triode is called the target and within the electron stream is a deflector electrode designed to alter the path of the electron beam, it would normally be connected to the anode. The tube has a white strip inside mentioned above that is illuminated on the ends as the signal is increased the two illuminated edges move towards each other until they touch at full signal. The Museum can demonstrate several different "Magic Eyes"